1. Preheat the oven to 450 degrees. Bring a large pot of lightly salted water to a boil. Trim the bottom 2 inches and any thick stems from the broccoli rabe; blanch 2 minutes. Transfer immediately to a large bowl of ice water. Drain well, pat dry with paper towels and chop into 1-inch pieces. 2. Warm 1 tablespoon of the olive oil in a large nonstick skillet over medium heat. Add the garlic and saute until lightly golden, about 2 minutes. Add the crushed red pepper, salt and broccoli rabe; saute 1 minute. 3. Sprinkle the mozzarella over the pizza crust, leaving a 1/2-inch border. Arrange broccoli rabe and garlic over the top. Bake directly on oven rack 10 minutes or until cheese is melted and crust is crispy. 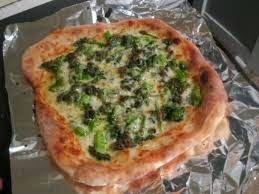 Drizzle pizza with remaining oil and slice.